"A wonderful way to use the over-abundance of squash from your garden. 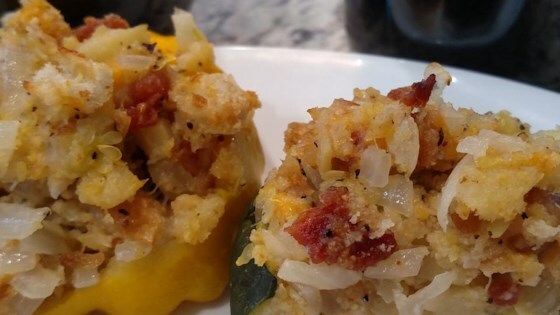 Cute pattypan squash are stuffed with a cheesy bacon stuffing, and baked. My children call these 'Squash Volcanoes' and gobble them up! Enjoy!" Very good. I added some fresh oregano and extra cheese to the bread mixture. Also baked it longer than the instructions called for. Excellent low calorie meal with a side salad. This recipe was wonderful! I used turkey bacon instead of real bacon and it was still great.